College is an investment in the future. Especially if you’re in nursing school or any healthcare program, the information you learn will enrich your career from the day you start until you retire from the profession. College, though, is also exciting and developmental outside of the classroom and lab, and we want our students to gain the most from their time at Ameritech College of Healthcare. Part of the educational experience includes living in a new city, befriending new people, and embarking on a brand-new phase in your life. Studying is critically important, but so is exploring the sights and sounds of your surroundings. 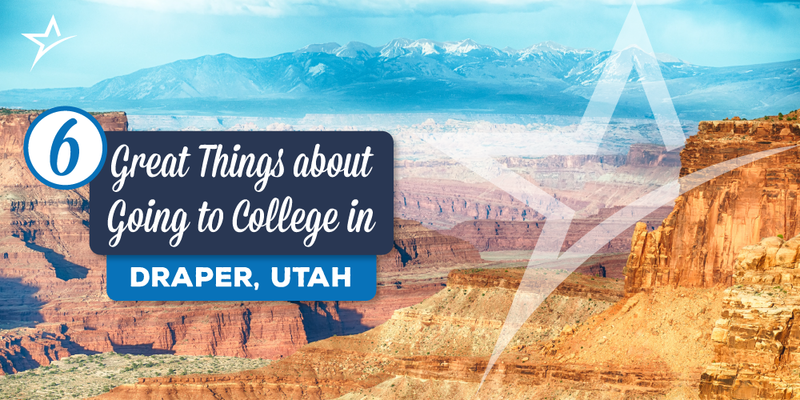 Attending college in Draper, Utah offers some wonderfully unique opportunities for students, and we’ve put together six great things about the area to get you started. If you’re craving a touch of the big city life, you’re in luck! Draper, Utah, is part of both the Provo-Orem metropolitan area and the Salt Lake City metropolitan area, which means the buzzing of Salt Lake City is only a short drive away from campus. Weekends are a great time to explore the beauty of Utah. If you’ve recently survived your first overnight clinical, you don’t have to travel far outside Draper to find nature to help you relax. Because being physically active is so important for a healthy mind, putting down the books and enjoying the great outdoors can benefit your studies and yourself. Draper is perfect for anyone who likes four seasons and the activities that go along with each, as the climate is dry and hot in the summer with a fair amount of snow in the winter. Draper has nearly 100 miles of trails for hiking, cycling, and horseback riding, and even something for the adventurous soul — the blowing winds over Traverse Ridge make Draper a mecca for hang gliding and paragliding. A lot of our students taking classes and caring for patients also have the responsibility of raising children and taking care of their families. When looking for nursing or medical assisting programs around the country, it’s important to also look for good places where your family can thrive. Fortunately, the small-town feel of Draper makes it an excellent place to raise a family while in school — and after you graduate. With Salt Lake City so close, and with a variety of rapidly growing industries available, your spouse or other family members will have more opportunities to find a satisfying career. The big city was named in the top five for highest employment growth in 2015. Draper also has a strong school system, a low crime rate, and many kid-friendly activities to keep everyone happy. 4. Why leave after graduation? After the elation and relief of graduation dies down a bit, you’ll be looking to dive right into your first job as a medical professional. While the opportunities for our graduates around the world are endless, you don’t have to leave if you don’t want to! Utah is home to a large cohort of young, educated professionals driving the economy forward, and healthcare is one of the industries at the center of all the growth. There are many elite medical institutions to help further your education, including the University of Utah’s Huntsman Cancer Institute, which was recently given the highest designation by the National Cancer Institute. Health services positions are up 5.7 percent, which is good news for anyone looking for their first job after graduating from a healthcare program. Draper, Utah, is located halfway between Salt Lake and Utah counties, making it an ideal place for a melting pot of people interested in all Utah has to offer. Draper is surrounded by a metropolis (North), a burgeoning economy (West), a skier’s dream (East), and a family-centric community (South). And as a student, you’ll have access to all of it! College is the best place to meet new people. When you go to college in Draper you’ll mingle with like-minded individuals who have similar interests and goals. You’ll make connections and bond over challenging school work, late study sessions, and mutual achievements your family or non-school friends might not understand. You’ll find your go-to people to hug when you’re having a tough time, and high-five when you aced the test you studied so hard for. They will help reinforce your commitment to school, motivate you when needed, and make everything, overall, more enjoyable. At Ameritech, our students are part of the reason why living and going to school in Draper, Utah, is so wonderful. If you’d like more information on how you can learn to become a nurse, medical assistant, or dental lab technician and join this thriving community, visit our website today!